I never watched the BBC wildlife series Big Cat Diary, and therefor I did not know Jonathan Scott at all before reading this book. I was attracted to the book because it is a biography of someone who is passionate about African wildlife, and particularly filming or photographing animals in the African wilderness. I share this as a hobby and strive to learn more and improve my skills by learning from the masters. In this regard the book did not disappoint. I read with great interest how Jonathan, who grew up on a farm in England, found his way to Africa and started by sketching wild animals, take photographs, and eventually became a celebrity TV presenter. He made Africa, and particularly Kenya, his home. Here he did not only film the wildlife, but also applied his academic background to studying wildlife behaviour. This made him a sought after presenter for any wildlife show. I got the impression that he did not do this just for the sake of being a famous celebrity, but because it was (and is) his genuine passion and interest. Most autobiographies that I have read, takes you on a journey from early childhood to current status. Usually this happens mostly in chronological order, and with my background in project management where things are well structured, I like this approach. But this book is not completely according to this 'normal' approach. While it starts with an honest attempt to describe Jonathan's childhood and gradual evolution into a legendary TV presenter, it jumps around a lot to different eras of his life. To me this is a bit irritating, but I assume that is a good reflection of his real life. He describes himself as someone who can talk a lot. I found the large number of names of all the people that crossed his life very intimidating. It is just too much to take in and to associate these people with any specific aspect. On the other hand, I accept that people in the same industry will find all the names and relations a very interesting read. From the book it is clear that Jonathan is a real family man. His love for his wife Angie and their sons is admirable. Angie is an award winning photographer and the book contains many of his and her beautiful wildlife photographs. I found this book fascinating and easy to read. 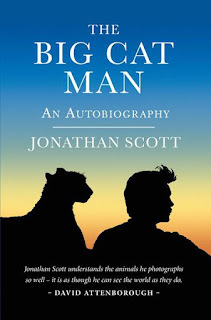 It can be recommended to anyone who knows Jonathan Scott and wants to understand his background before becoming a celebrity. People who do not know Jonathan Scott but who are interested in wildlife, filming or photography will also find the book very interesting. Distributed in South Africa by Jacana Media.